Let’s start with some good-ish news. I lost another pound this week. I’ll admit, I was hoping for more weight lost than that, I mean I have worked-out every day this week. But, I also had a few beers and I’ve had a PB&J for lunch every day. I know PB&J’s are filled with calories but they’re so good and convenient and cheap! 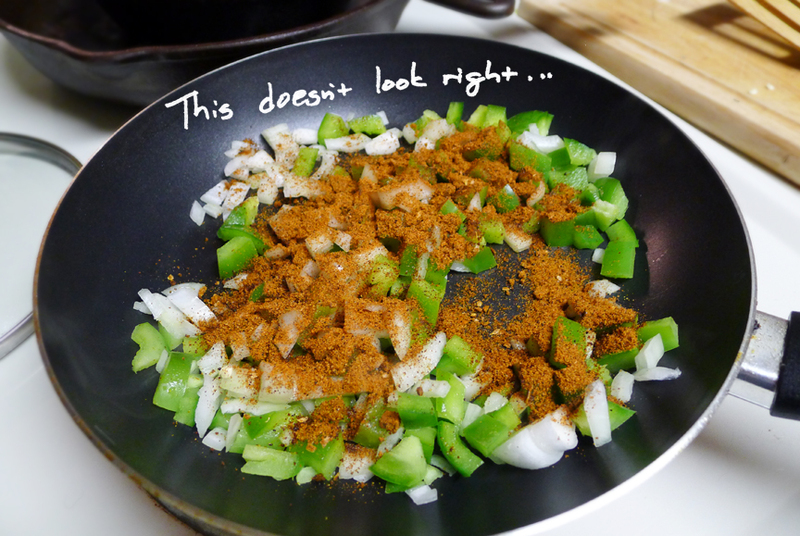 Enough weight talk – let’s talk food! 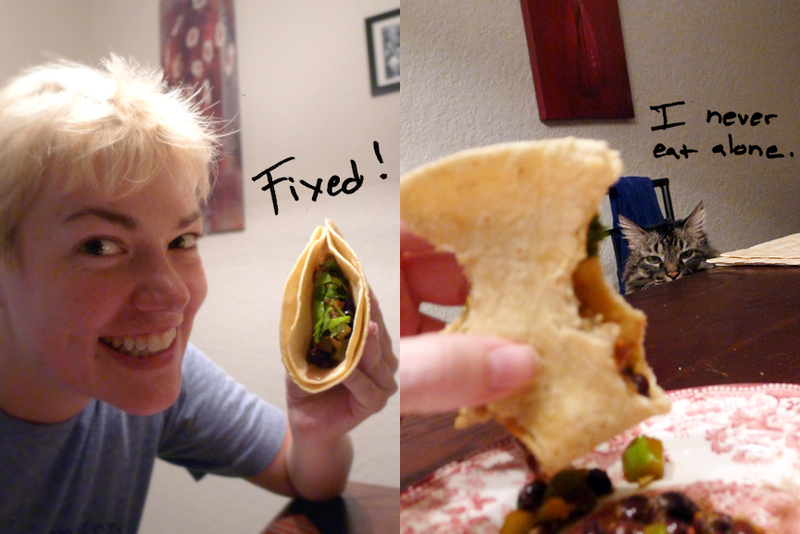 I love Mexican food, I could eat it for three times a day every day and be so very happy. 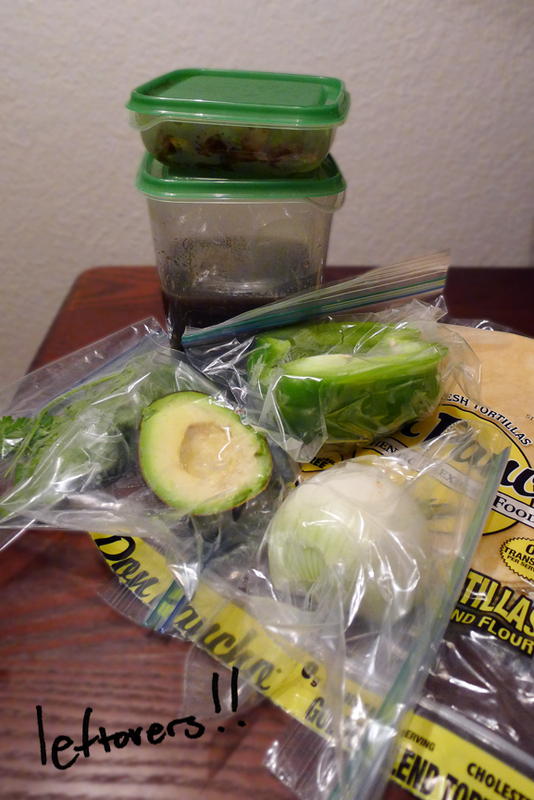 My friend Karley gave me this awesome taco recipe that’s super cheap and easy too! Please notice that everything on the photo is under $2.00. I spent a total of $7.03 on this meal. Also, aren’t you impressed by how long that cilantro has lasted? I know I am. Right, so start by chopping veggies and heating the can o’ beans. 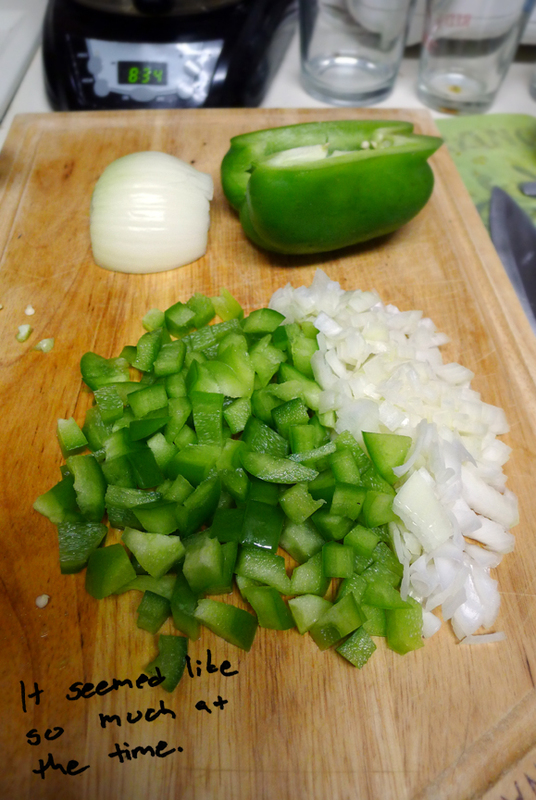 While chopping I decided I only needed half the onion and half the green pepper. Then I remembered seeing my mom add water to taco meat when she seasoned it, so I figured the same principle would work here. And it did and it was magic. 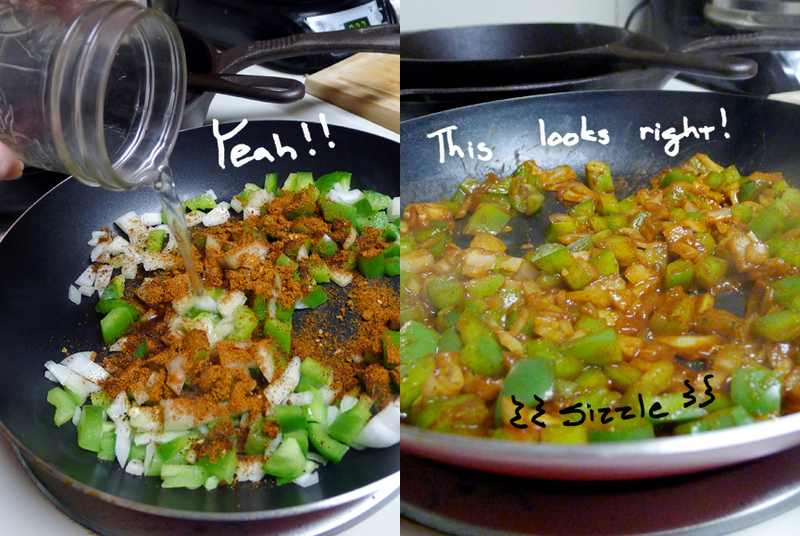 Then I realized that the heat was on too high because everything started sticking to the pan. So, I panicked and just turned the heat off. 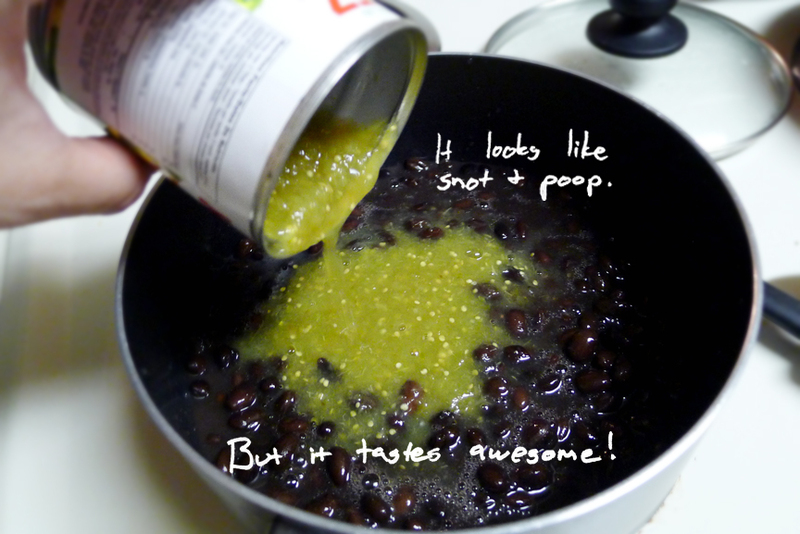 Next I mixed in the green sauces with the now heated beans. All that’s left now is to heat up the tortilla. Karley suggested dabbing them with water so that they would be steamed and wouldn’t tear. 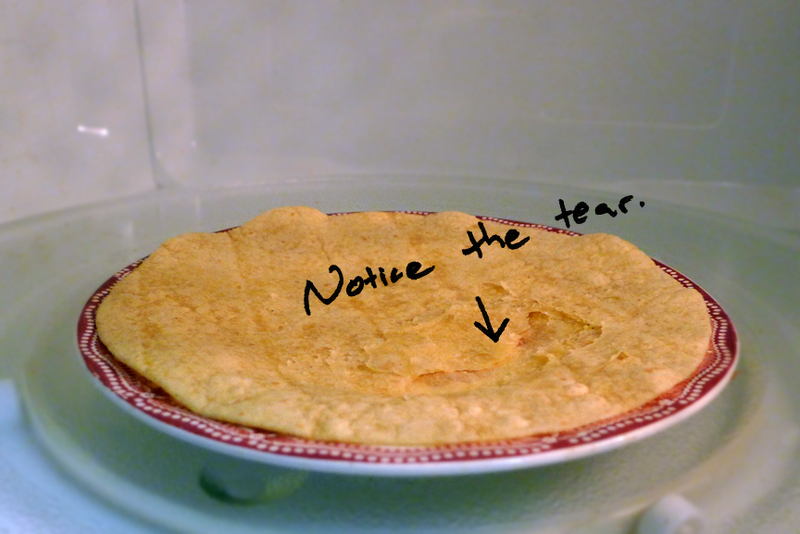 The problem is though, (probably because I bought cheap tortillas,) when I pulled one out of the package it tore because it was sticking to the other tortillas. There were still some layers where it was torn though so I thought it would be okay. Now pile everything on! 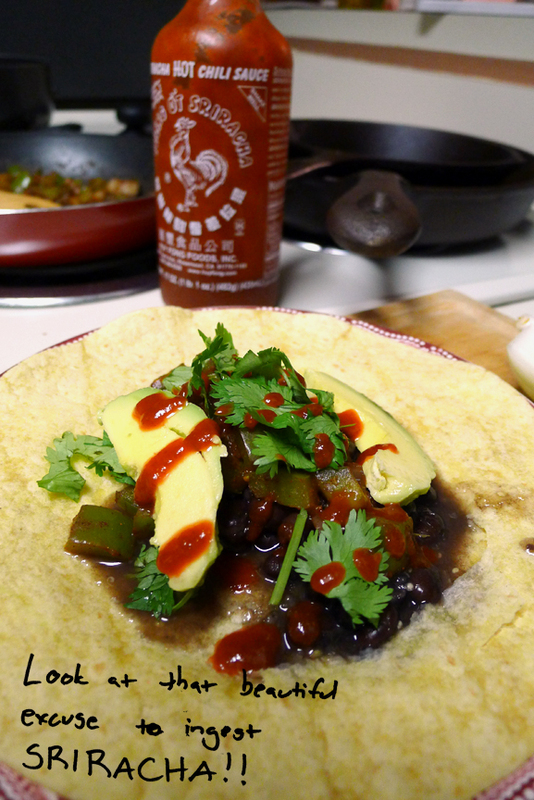 This includes beans, sauteed onion & peppers, cilantro, avocado and of course srirachi. *Note: While eating leftovers of this I added some of that goat cheese I had left over from the salad and it was a bit too rich, if you want to add cheese I would stick with the classic sharp cheddar. Now you probably guessed what happened when I tried to fold this thing up. It ripped apart. But I’m supa smart and just doubled up the tortillas. I don’t know if it was that I used two tortillas or if I’m just getting used to smaller portions, but this baby filled me up! I loved every bite though. Plus, there’s tons left over! Next time I think I’ll drain the beans a bit because it was a little watery and I will chop up the full onion and pepper – I’m just going to chop up the other halves that I didn’t this time because I’m sure they’ll be the first thing to run out in my pile of leftovers. 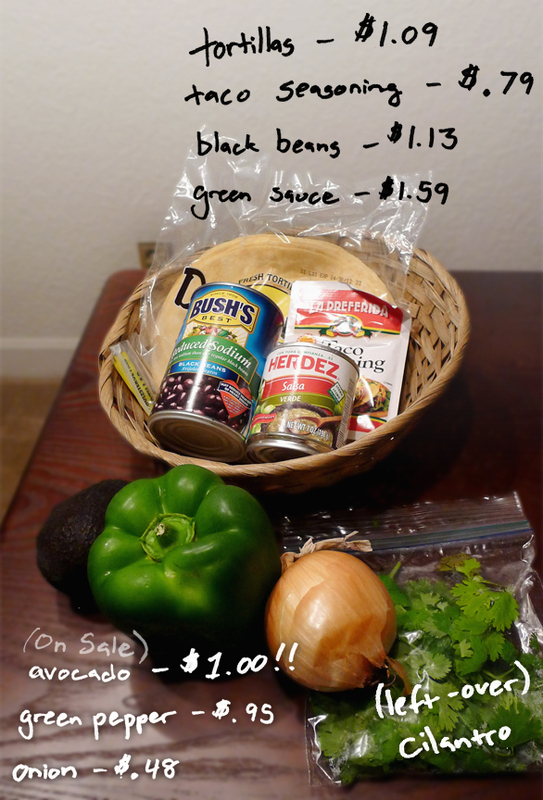 This entry was posted in Recipe and tagged beans, black beans, cheap, cilantro, dinner, eating, economical, food, green pepper, leftovers, magical recipe, pictures, smart, taco, taco recipe, taco seasoning, vegetarian, vegitarian, weight. Bookmark the permalink. Ohh my gosh I am in love with your blog. That picture of your cat at the table had me DYING! My cat does the SAME thing. I too never eat alone. This meal looks great, and even better the PRICE breakdown..ohhh I got goosebumps. Saving money at it’s finest. Thank you very much Brittany. Aren’t cats so weird? But they’re soft and fluffy, so it makes up for it. I like your writing style ! It is so charming. I have one language question (I am from Germany): “Does I know I am” means something like hej I am so good (most of the times in an ironical version) ? It could, but in this case I was answering my own question by saying that I was surprised that the cilantro had lasted so long. Thank you for your encouragement! Love, love, love it! And I’m glad you remembered using the water with taco seasoning. I remember watching my mom do the same thing. The hardest thing about cats is their extreme judgmental-ism.